Chef Joanne Chang and Christopher Myers — 10 plus! FLOUR Bakery + Cafe Chef Joanne Chang and Christopher Myers, Myers + Chang, presented three outstanding programs -- one for the general public at the Halekulani Hotel and two at Kapiolani Community College for students and professionals. Chef Chang and Christopher Myers shared humor, personal insights into their business philosophies as well as pastry/baking expertise. 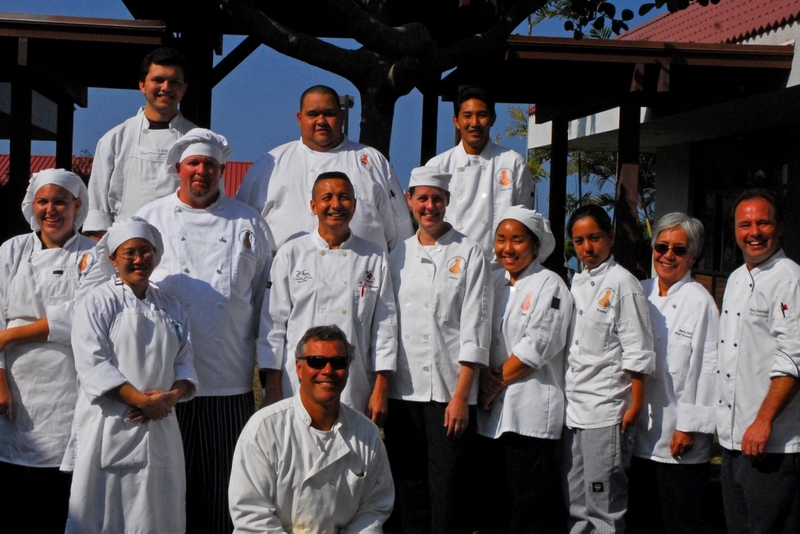 Who attended: 115 chefs, cooks, special guests and business owners from Hawaii, Oahu, Kauai and Maui 118 students/instructors from Kapiolani, West Hawaii, Leeward, and Hilo Community Colleges 130 Halekulani Hotel attendees Professional comments: Wonderful!//10 out of 10//Exceeded all expectations//Great as always//Very thorough and wonderful attitude//Very informational. I loved the personal stories//Great baking tips and advice on running a bakery Student comments: Yes, I was hoping for a program to inspire me and this one did so exceptionally//IT WAS FUN!//Exceeded, they are amazing! !//The information on how to get a job was just what I needed now//Far exceeded, so inspiring and informational//Yes, I learned a lot about the business//Exceptional, informative educational and helpful to a graduating student in pastry arts/culinary arts. 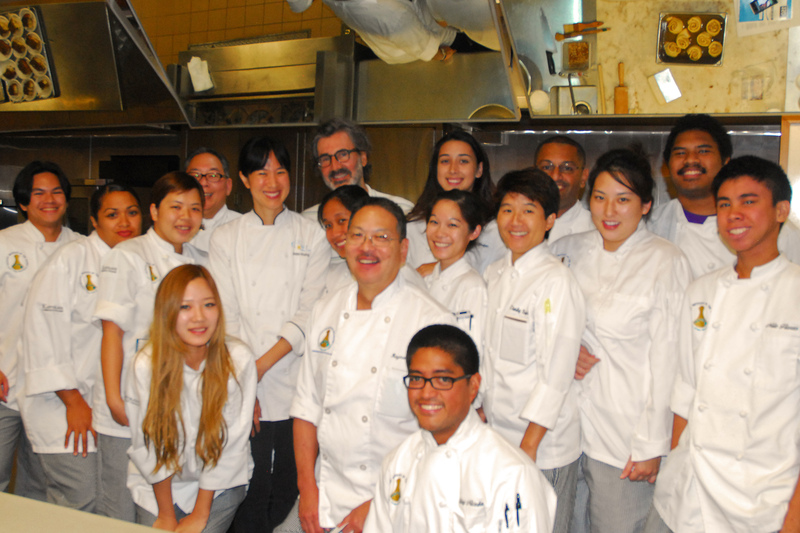 Chef Chang's visit was made possible by: Kapiolani Community College in cooperation with the Hawaii Culinary Education Foundation, funded by the Lyle L. Guslander Distinguished Visitors Program. Special thanks to: Halekulani Chef Vikram Garg, Pastry Chef Mark Freischmidt, General Manager Gerald Glennon and the Halekulani staff Chefs David Brown and Alan Tsuchiyama -- KCC students Armstrong Produce Joan Namkoong Chef Chang was nominated for a James Beard award. Flour has been featured in Gourmet, Food & Wine, Bon Appétit, the New York Times, Conde Nast Traveler, Lucky Magazine, Inc. Magazine, and Boston Magazine and has received numerous Best of Boston awards. Flour was also featured on Throwdown with Bobby Flay on the Food Network in which Joanne's sticky buns won over Chef Flay's. Chef Chai, owner of award-winning Chai's Island Bistro and Singha Thai Cuisine, shared his personal business philosophy and tenets of Thai cuisine with 55 Leeward Community College students on January 30. 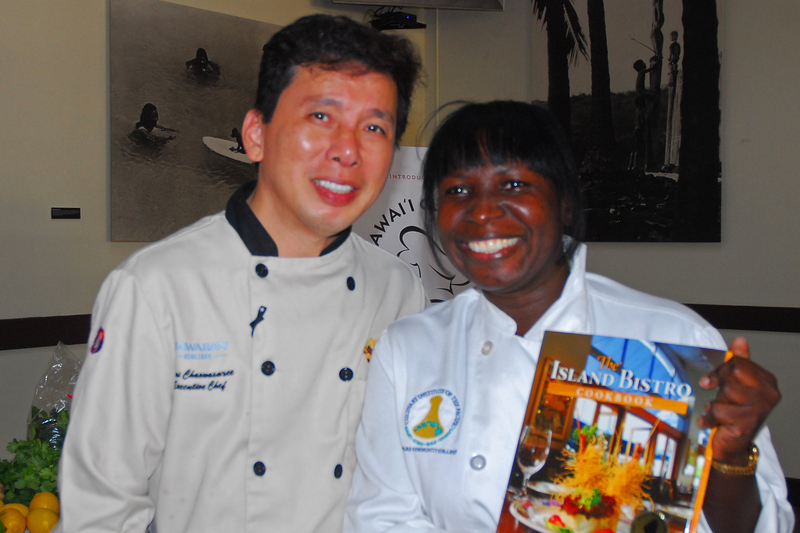 Chai is a cookbook author, star of his own cooking show and the Executive Chef for Hawaiian Airlines. Chef Chai prepared Thai Red Chicken Curry with Bamboo Shoots and Fresh Basil and Grilled New York Steak Salad with Big Island Baby Greens & Lemongrass-Garlic Dressing from The Island Bistro Cookbook. In the process, he explained the ingredients used in Thai cooking and the keys to business success. Here is what the students had to say about their experience: It was very inspiring. If you have passion, drive and the right attitude you can do anything//Yes, loved the demonstration and his willingness to answer questions//Yes, it was more than cooking!//He perfectly explained where he came from and how he achieved success.